This timeline was originally created to organize the notes from a year of reading to prepare for the College Hill Bicentennial Living History event on Sept. 21, 2013. 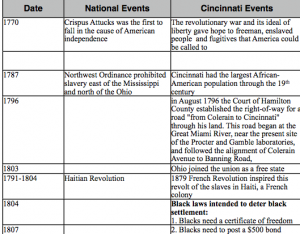 It was my attempt to understand the local events along Hamilton Avenue in the context of Cincinnati, Ohio and national abolitionist movement. Any additions or correction, would be appreciated.